How to Edit an Essay? The best writers will keep editing in mind from the very beginning. They write their essays in modules. In other words, they write their essays in sections. The sections may be as small as paragraphs or as long as chapters. At the end of the writing process, they are able to shift, chop and change these modules in a way that fits their editing plan. For example, a student may have written several sections that give the many advantages of capitalism, he/she may have written about it over a number of weeks. The essay was written in modules/sections, so all the points on the advantages of capitalism may be gathered up and edited into a single chunk of the essay by simply gathering up all the modules/sections that mention the advantages of capitalism. Things such as transitions often require nothing more than an introductory sentence here and there, or maybe just a new heading. Even this article has been written in modules that were separated by headers. Notice how many of the headers, and text following the headers, may be switched around without it damaging the overall meaning of the article? For example, you could put this entire section at the end of the article and the article would still make sense. To start with, unless your professor has explicitly told you to track your errors, you should not track any changes to your work. 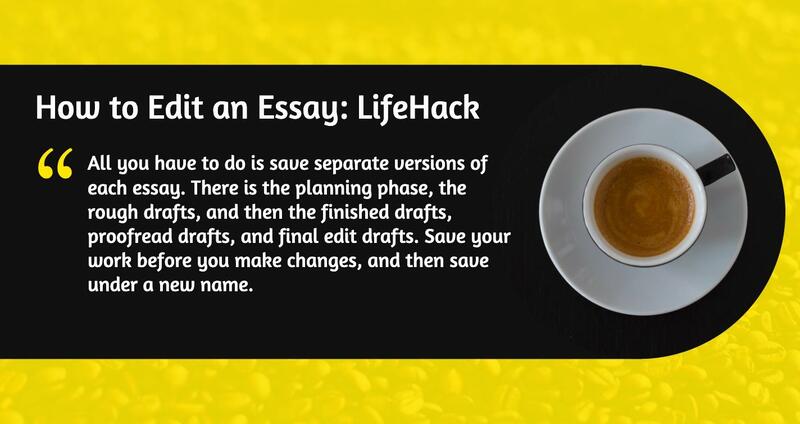 All you have to do is save separate versions of each essay. That is what the professionals do at Assignment Holic Service. The AssignmentHolic Service works on hundreds of essays per year as they create original and custom-written papers for students. During the essay-writing process, they save in drafts. There is the planning phase, the rough drafts, and then the finished drafts, proofread drafts, and final edit drafts. Save your work before you make changes, and then save under a new name. For example, you may call your first effort “Draft 1” and then save as “Draft 2” and so forth. By the end, you will have a folder full of different documents called drafts. If you make a mistake while you are editing, you can go back into an earlier file and retrieve your work before you made the changes. You have a few choices when learning how to edit a paper in Word. Many students are told to put their text in double or 1.5 spacing, and this may help you isolate essay segments in a way that makes it easier to edit. Word has spelling paper tools such as standard spelling and grammar checker. The spelling paper checking tools will only pick up on obvious errors. Very few tools will pick up on correctly-spelled typos. That is why checking your paper manually is required after you have finished with Word’s tools. It is highly recommended that you increase the zoom level on your Word document when you are learning how to edit an essay. It forces you to pay attention to your work on a line-by-line basis, so you may notice spelling mistakes and article errors more easily. Plus, it makes it harder to skim read your paper as you check it. Double check your work for consistency. If you have spent a lot of time writing your paper, then you may have made points that contradict other points you have made, and you didn’t know you did this you forgot what you wrote over the weeks it took you to write it. Also, check the weight of your paper as you probably need to apply the same word count and emphasis for each point you make. Have you spent too much time making one point and left too little word count to make the other points you wished to make?